Bad UFOs: Skepticism, UFOs, and The Universe: Skeptics and Claims of "Earthquake Lights"
They claim that 85% occur near rifts. I have searched every site regaurding the Great African Rift(pulling apart), where they have had cameras & recording equipment set up for years. Not ONE mention of lights! This rift ends near Israel & with quakes there, also no mention of lights in the sky, & probably the most scrutinized airspace on the planet! I like how these sites all start with the reference that these lights have been observed for hundreds of years. AS most of us have probably seen the 1651 & 1657 "woodcuts" of orbs & strange lights in the sky (Nuremberg & Basel), these were not the harbingers of earthquakes. Instead they describe a UFO battle in the skies. The depiction & description of some falling to earth & exploding in fire & smoke seems to nullify the "Sundogs" explanation chanted by many skeptics. My point being that old time descriptions are not taken as fact, so why state this as common knowledge of old descriptions of earthquake lights ,especially as many use to think meteors & lightening were signs from god. If anything, sorry fellas, those orbs look like the BoLs seen around cropcircles or the hundreds of UFO orbs that can be seen on the net. As for Electro Magnetic Fields, their seems to be an enourmous amount of activity in regaurds to this of late. A quick search of radar weather anomolies show curious spirals, circles, donuts & other symmetrical patterns, even where the skies are blue & there is no storms or rainclouds. There have been a lot here in Aus, especially around the Harold Holt Naval station, long linked with submarine communications. (NW cape WA). Even over Alabama,Huntsville, meteorologists couldnt explain the large blob on their radar image, until it was explained as Chaff 188, deployed in a military training exercise. In a 1997 DoD News Briefing, Sec of Def- William S. Cohen > "warned of the use of electromagnetic waves to set off earthquakes". Researching this I have also found that the optimum way to control the waves is to reflect them of ionized particles in the ionosphere, namely barium & aluminium. Does this explain the chemtrails worldwide? Chaff 188 is aluminum coated silica, which gave the radar anomolie, but at low altitude. What is the radar reflecting off in high altitudes? Since light is made up of waves, & can diffract by passing through particles. Could these irradescent clouds be caused by HAARP waves bouncing off metal particles in the atmosphere. Another crazy conspiracy? HAARP exists. DoD admits. Chemtrails are visible, & the only explanation of weather radar anomolies comes from our old friends in the USAAF> Chaff? Flares? Weather Balloons? Wow, for once I can agree with some of what Deano has written! ;) Yes, anecdotal accounts over long time periods do not prove a phenomenon. Too many counter-examples for that. But Deano, you do realize that HAARP has been shut down? So now you'll have to find something else to blame. "Chemtrails!!? Let's not get started on that one. I suspect that zoamchomsky might have something to say about it? (Cover your ears!)" What? Me over the top? Hardly! (vbg) Thanks for the shout-out. It takes a tough skeptic to cook a tender loon. That is: I doubt very much that TST explains over a century of many thousands of wandering-lights "UFO" stories, and certainly not the hundreds of reports of landings of unambiguous airships, balloons, mystery airplanes, flying saucers, other imaginary spacecraft, and of their human-like or otherworldly pilots and crews interacting with human beings. The TST of "UFO" reports adds very little. There's a much simpler explanation that explains the data completely and has resisted falsification for decades: the Null hypothesis and complementary PSH. But seriously, deano, as I regularly ask loons: At what point does our modern Scientific-realist worldview break down for you? (and since the "UFO" myth is the core delusion on which most others depend) At what point exactly does the irrational notion that phantom aircraft haunt Earth's atmosphere and nearspace inject itself into your otherwise practical existence? At what time of day do fantasy "unicorns from outer space" become plausible to you? Please say. You might think I am a crazy conspiratard, that "swallows hole" every theory out there but I beg to differ. & the recent radar anomolies >Norwegian Spiral(Russian missile failure) & Huntsville, Alabama (Chaff 188). This blog is about Earthquake lights. But my immediate thoughts turned to Strange Rdar Anamolies preceding these events. I am not pulling this stuff from nowhere. The anomolie over Huntsville's epicentre, was at the bldgs of Raytheon, BAE(Haarp in Alaska builders), Northrop Grumman & deciBEL Reasearch inc> all heavily involved in the SBX-1. Sea-based, self-propelled, giant phased array radar on a ex-oilrig currently in the Pacific. Isnt this a bit too coincidental? I think the biggest problem skeptics have is the moral issue of "they couldnt do that to the public". Apart from soldiers used as atomic guinea-pigs, workers exposed to asbestos, chemical weapons, napalm, depleted uranium weapons, & the documented evidence of "OPERATION NOTHWOODS", there is more than enough proof that ethics & high morals are something they arent too concerned with. Once people realize this & start to question what are the real reasons behind all these events, a little research , follow the money, see who benefits, & the answers fall into place. Scientific-realism. Even Shermer shouts this one. If a proffessor mentions the words "Intelligent Design", they can lose tenure & employment being cast as a "bad creationist". Yet if Dawkin's is questioned on the origin of life(a devout evolutionist,Darwinist, The God Delusion) it is alright for him to quote "Directed Panspermia". Life brought to earth by aliens. Yet Bush's rantings after 9/11, God is on our side, the crusade against the evildoers, God Bless America, blah,blah,blah GOD IS AMERICAN !! You cant have it both ways. In God we Trust is on the dollar, but you cant mention that in Academic circles. Manning in jail,Assange in assylum,Snowden hiding in Moscow. The TRUTH must be hidden at all costs. Still think US govt doesnt hide things from you? Once they have control of the weather, & can influence natural disasters, normal war weapons are a sideshow if countries are continually battling the elements & in a perpetual state of disaster control & clean-up. The evidence is all there Zoam, but if you refuse to even look, how will you ever know? 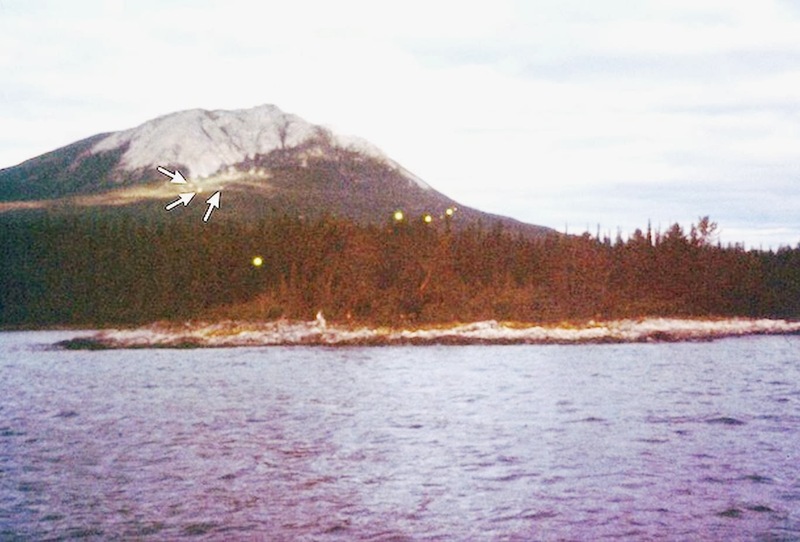 Suddenly the interest in earthquake lights , seems to be a "scientific" reason to explain UFOs & strange lights. Even Robert isnt buying into this load of baloney. My theory is the electro magnetic Haarp waves can affect the atmosphere,bounce of metal particulates & cause strange lights, irrradescent clouds etc. The govt is covering its hide & encouraging this "New Explanation"
Just to "correctly inform" readers, please have an OPEN-minded look at HAARP Patents, COBRA DANE, Strange Radar Anomolies, the SBX-1, references to AL.Ba & Str oxide & how they all can be related to Obama's "Asian Pivot" & Pacific Trade & maintaining the US as a Super-power. More scientific realist versions. Geo-engineering, Solar Radiation Management, Global Warming Reduction, Cloud Seeding, Atmospheric Shielding but dont,dont ,dont ever use that word Chemtrails. I am not a loon "haarping"( lol), about toxic poisoning or being used for mind-control. My belief is the chemtrails are adding Al,Ba & Str oxides into the atmosphere so to act as reflectors & enhancement of electro magnetic waves as specified in the actual "HAARP Patents". Ionizing the plasma content in particultes to increase the cyclon electron whistler-mode effect, as the "scientists" & "realists" call it. Basically maximising the beams & waves to heat the atmosphere & so affect the weather. By only adding this to wing tanks, any jet can spray the chemicals in the upper atmosphere(looks like contrails), & land & take off on the central tank( heavily filtered or not present). & now "scientists" are stating the best method to stop global warming is to spray aerosols into the upper atmosphere to reflect the rays from the sun. Say what? UV rays? Only repeating the SCIENTIFIC views. God help us? You might want to check out the Vogel report on the Toppenish light phenomena in Washington State. Link in this article from 2 years ago. I'm having trouble with those links you're providing. The USGS just goes to a menu page, not a report. The Vogel report link does not go anywhere. That wouldn't happen to be Marcel Vogel, would it??? 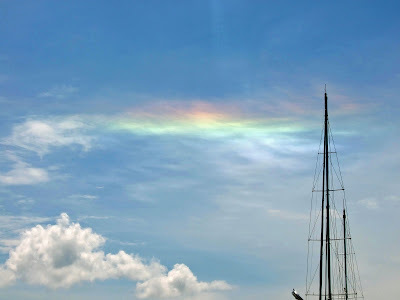 That video of the supposed Sichuan earthquake lights on your page is, as I show in the Blog text, almost certainly iridescent clouds. Natural explanations of UFO sitings form a hierarchy from most probable to least probable. 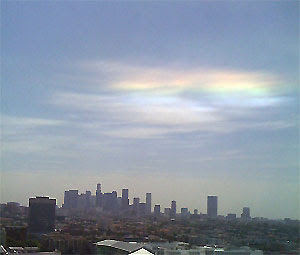 The article makes the point that earthquake "lights" are less probable than iridescent clouds. I wonder if "cigar-shaped" iridescent clouds can explain the famous JAL siting. Which of flying-saucer repeater Terauchi's "spaceships" (his own word) were "cigar shaped," the two "scout ships" or the "giant mothership?" (again, his own words) His report didn't claim that he witnessed mere ambiguous stimuli, "UFOs," this very heavily steeped in flying-saucer mythology adult claimed to have seen "spaceships" from another world. Terauchi would later express great sadness and regret at being so thoroughly possessed by an "illusion," the myth that Earth is being visited by ET. Terauchi's hysteria caused by fatigue initiated a textbook Small Group Scare in his cockpit that involved others on the ground and in air. At no time did radar images of clouds and ground clutter coincide with Terauchi's imaginary "spaceships." And for such a fantastic occurrence as Terauchi would confabulate afterwards, there is very little discussion of the "spaceships" among the crew. The copilot said he saw "just some lights" miles ahead, and they were standard plane light colors. Up until the moment that the first of two intercepts passed Terauchi's 747, he was reporting the "giant (flying-saucer shaped) mothership" on his tail, then it suddenly vanished. It was never there! Terauchi imagined things that didn't exist in flight and confabulated all the rest. FAA tapes show only an echo of the 747 off mountains fifty miles behind. Didnt he describe a "giant walnut" shaped craft? There is a photo showing him holding this sketch & other sketches showing the giant walnut in comparison to a 747. He describes white & amber lights bigger than an aircraft carrier. Didnt he also refuse military assistance because he remembered the "Mantrell" case? Teraauchi & FAA Callahan are both wackos I suppose.How do they get these positions if delusional & prone to LIES? Robert, awhile back (2010?) we had an earthquake on Easter Sunday here in the San Diego area. The quake was centered near Mexicali, Baja I believe, but rocked El Centro, Ca and of course felt all the way towards San Diego. As a whim, I attempted to see if I could correlate the "Tectonic Stress" concept to an increase of UFO sightings in and around the El Centro and Mexicali area. Looking at all of the UFO reporting data bases, I found nothing of substance to back the theory. Yes, I remember that Easter Sunday earthquake. I'm sure that's the one referred to in the supposed San Diego Earthquake Lights photo, taken from the "beforeitsnews" posting cited above. It is dated as May, 2010, hence my comment that it was "several weeks" after the earthquake. Obviously, just iridescent clouds. Not surprised that there's nothing in the UFO data bases from this. Of course, if you're willing to time-shift weeks or months, or geography-shift hundreds of miles (as some do), you can always find an earthquake to accompany any UFO sighting. As a comparison, the incident I described of the apparent earthquake precursor (the railroad signal) occurred within approximately two minutes of what its Wikipedia page says is the 22nd-strongest earthquake in California in recorded times, and something like 7 miles from its epicenter. If we started to get reports and photos of supposed "earthquake lights" constrained as tightly to earthquakes as that, then I would reconsider my position. I dispute the "skeptics gushing" comments. I have researched earthquake precursors (not as a professional geophysicist) but as a geologist interested in natural anomalies. Much of the work has been done in academic journals as well. What I found was that the US supported seismolgical program was busy testing other more reliable indicators of earthquakes. These natural phenomena are unreliable and require many variables coming together at a certain time. Thus making them hard to study. But I find the data rather compelling, plausible and very intriguing. It makes me excited that we may be onto better information about EQLs but I find this post to be off the mark. You were not the only skeptic who posted favorably on this subject! You say that you find the data "rather compelling, plausible and very intriguing." I find it exactly the opposite - anecdotal, inconsistent, and supported by some obviously bogus photograpy. Just like UFOs. Supposed earthquake lights can occur before, during, or after major earthquakes, and can be in practically any shape or size. If somebody can provide solid and convincing evidence of supposed earthquake lights, I would be happy to be proven wrong. Thank you Robert, agreement is good! My comments will surely rustle some feathers, but you have to wonder about these strange "radar anomolies" occuring around the world. OK your govt has said it has shut down HAARP. The same govt that said there were WMDs & NSA spying was limited to terrorists.Being "skeptical", I still cant believe you trust these people at face value. Denial in the interests of National Security is an american priveledge. "Strange Weather Anomolies-Dregs of the future" has a very good site with loads of pictures,information, links & alas, the inevitable "Terminated by Youtube" videos. Radar images over US are all gone but the ones over Australia & other countries are still there. Alaska's HAARP may be shut down, but there is many new installations like the AMISR (phased radar array) panels, using more advanced technology & able to pin-point & concentrate beams. An interesting section is on cell-phone towers. I myself have noticed many new towers being erected here in Aus, yet we have had good reception for years without these. The contractors comments are very interesting describing the "enourmously unnecessary" power supplied to these, & military contractors coming in at the end to install "AMPLIFIERS". In my searches I also found the "SBX-1" a self-propelled converted oil rig with a huge radar on top. The "explanation" is its the latest missile tracking device. Really? Surely the Navy has used the Ultimate radar devices for years,being highly manouverable & with self defence capabilities on their ships, even purpose built radar & comms command ships. Why the backward step of placing this "state of the art technology" on to a slow moving 8knt rig? The more "logical" explanation, being semi-submersible for stability, is it is used for pin-point accurate beam projection, & used with other radars from landbased sites, can "TRIANGULATE" these beams very accurately as they are bounced of the ionosphere ( with ionised al & ba as the reflectors). I am trying to map the history & movements of this SBX-1 & it seems it has a lot more relation to Earthquakes, Hurricanes & Tsunamis than any Earthquake Lights. The giant glowing ring over Chile , looks more like one of those radar anomolies than colourful clouds. What was wrong about being excited about new information on an intriguing subject? The authors sorted through the anecdotes (some were recorded on video so they weren't just anecdotes), and picked a small subset of the best to study. Note that some occurred when exploding transformers was not an option for explanation. The reason I got excited about this was that there was a careful effort to qualify and categorize the data. They have proposed a testable claim that has not only a physical basis but is a plausible mechanism that does not overturn any existing idea. The problem I had with this piece was that it was a straw man argument that the idea is kooky, their data is goofy and they tend to publish in questionable places. All of that is not true. The examples you give above as earthquake lights are NOT what they used in the paper. And, the paper puts the TST in a different category, not what they are talking about. Also, this is a sound journal where it will get proper peer review. So I am justifiable excited to see how this idea flies. Good collecting, analysis, theorizing and publishing is what we ask for. They have done that. That's commendable, not something to discard out of hand. The US Geological Service has issued an earthquake early warning alert. Rainbow colored clouds and bright glowing orbs have been reported in your vicinity. Evacuate your home or office building immediately and proceed to an open area. Wait 4 hours. If no earthquake occurs, the orbs were probably UFOs so it's safe to go home. 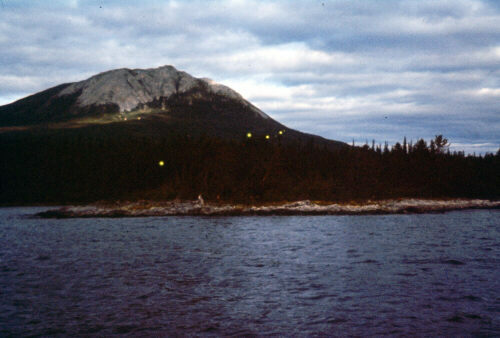 Sharon, the descriptions of the ‘earthquake lights’ themselves, and the earthquakes supposedly producing them, are in the “Electronic Supplement” to the paper by Thériault, St-Laurent, Freund, and Derr. I quoted from it in the above Blog posting, and also provided the link: ftp://ftp.mrnf.gouv.qc.ca/Public/Geologie/Robert_Theriault/SRL-D-13-0059-esupp.pdf . This supplement reads like just about any collection of UFO reports I have seen. People see lights they cannot explain, and this gets turned into something amazing. One thing to keep in mind: looked at on a worldwide basis, earthquakes are quite a common phenomenon, although of course they are not distributed uniformly. On average, there are about 134 earthquakes of magnitude 6.x each year, or about one every three days http://earthquake.usgs.gov/earthquakes/eqarchives/year/eqstats.php . A magnitude 5. something, 1,319, and so on, increasing by about a factor of ten each step as we descend the ladder. This is because the magnitude scale of earthquakes is exponential: A magnitude 6 earthquake releases 10 times as much energy as one of magnitude 5, and so on. One criticism that has often been applied to claims of ESP is that it does not seem to be related to distance, shielding, etc., which generally runs counter to physical phenomena. A Remote Viewer can supposedly view something in a distant submarine as easily as in the next room, and can view the future as well as the present or past. That same criticism applies to earthquake lights as well. A small earthquake, or one hundreds of miles away, or one hours or days in the past or future, produces earthquake lights just as easily as a major earthquake, right here right now. “The globe of light was seen 11 days prior to the foreshock of the Saguenay earthquake series” (Figure S1) So, earthquakes still 11 days in the future (and presumably 11 days in the past) can produce light globes. And how long is it from the foreshock to the earthquake? Double that interval (before or after), then add it in. How many earthquakes occur globally during that interval? “a tremendous flash in the sky” was reported during a M3.7 earthquake (#6), which results only in minor shaking. This earthquake releases only .001 as much energy as a 6.7 quake. The M5.2 Waynesville, North Carolina earthquake of 1918 is linked to the famous Brown Mountain Lights (#7), long reported and long debunked by skeptics. 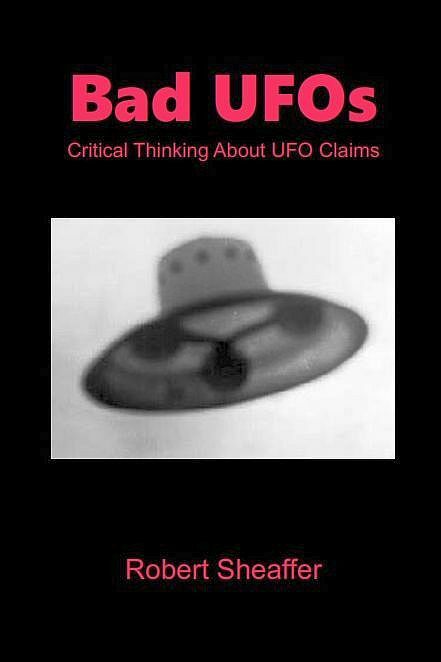 See Klass’ UFOs Explained (chapter 7). This is the publication about which Ken Frazier said, “They seem to be interested in promoting fringe topics as real mysteries and they tend to ignore most evidence to the contrary. They publish 'scholarly' articles promoting the reality of dowsing, neo-astrology, ESP, and psychokinesis.” And Earthquake Lights. The bottom line for “earthquake lights” is: you cannot ground a theory in physics on uncorroborated eyewitness testimony about lights in the sky. If you have instrumentation, videos, etc., then that is potentially a different matter. But remember that the motto of the Royal Society of London, the oldest scientific society in the world founded in 1660 that institutionalized the modern scientific outlook, is Nullius In Verba: “take nobody’s word for it.” In other words, if all you have are “words” about some particular alleged phenomenon, you don’t have anything. I am skeptical of the electron hole theory to account for the electrical conductivity of semiconductors, such as in the paper by Freund referenced above. In philosophical logic, this error is called "the reification of a zero." An electron hole is the absence of an electron, but this absence then has properties--but it really does not. The reason why physicists have to resort to this fallacy is that they need the semiconductor (a rock or a solar cell, for instance) to be electrically neutral. The theory I work in, called the Reciprocal System, says that ordinary electrical conduction is by chargeless, massless electrons, and so there is no need for an electron hole. The observed electron (which has mass and charge) is not involved in ordinary electrical current; from inspection one can see that a flow of static charges (i.e., charged electrons) is not the same as the flow of the electrons in our ordinary electrical wires. Now getting back to earthquake lights: correlation does not prove causation. My impression of 'earthqake lights' was that they referred to flashes of light produced as rock was physically broken, which would not appear as glowing globes or anything 'aerial'. Persinger seems to suffer from a problem many skeptics have: believing that there is something 'real' to a paranormal phenomenon for science to explain. His work with EM fields, brain activity and hallucinations sounds very 'right' at first, but the results just aren't there, and when you get down to it, you can't even say the phenomenon is. As someone who lives in the area, I can't say I've seen much publicity from Laurentian hyping his work. I stand by my opinion that this post was a straw man portrayal of the EQL literature, and what was actually presented in this paper. (I read the paper, not just the supplement). I found it to be a good example of cataloging an anomaly (that can not be so easily dismissed) across time and proposing a testable theory that does not challenge any natural laws. I still don't know who the other "skeptics" are that you mention. But in my case, I was excited that the idea is being addressed in a scientific forum, not on UFO blogs. I'd say it's possible that some of the sightings through the years can be explained this way. There are so many misidentifications of lights that a huge number of different natural phenomenon are involved. What Robert is saying is to be skeptical not only of UFO claims, but equally so of answers that aren't extremely likely. I looked at reports of luminous balls of light on the Yakima Indian reservation and wrote a book on the subject, EXAMINING THE EARTHLIGHT THEORY (1990). The impression I have regarding comments on this blog is that those touting them are a bunch of materialists who are skeptical of virtually everything except themselves. I doubt that any of you have read the very large amount of information regarding anomalous lights. New Scientist just ran a piece on the Hessdalen, Norway, lights with a workable hypothesis to explain the globes of light in natural terms. It seems to me that extreme skeptics as yourself enjoy taking potshots of anything that you have no knowledge of purely for the thrill of it. You've heard of them--the proverbial armchair skeptic -- or the Peanut Gallery. This is an interesting set of discussions about the TST, Persinger and earthquake lights. But surely your Google search of the subject must have found my own many skeptical articles published in the refereed scholarly journal Perceptual and Motor Skills, in which Persinger published his claims, as well as my original detailed analyses of the TST that is available online. Readers can peruse them and judge for themselves. I have no doubt there are phenomenon that happen during earthquakes that are either not well documented or understood. Having lived a portion of my like in Southern California and having been through some large earthquakes, I had never really experienced anything out of the normal. Violent shaking, aftershocks, and the normally reported sound waves that can be heard some times before the earthquake hits. In August 23, 2011 at about 1:30 pm I went home for a late lunch. I live in South East Virginia now and was trying to get some of my radio stuff in order for Hurricane Season. Having built an interface for my Amateur radio to hook my computer into and decode and send digital signals on HF. I was on the 40 meter band segment at 7.070 Mhz lower side band. I was decoding some BPSK-31 signals when the band went quiet. Not like a normal propagation shift, but similar to what has happened when I am on the radio when a Y or X class solar event hits the atmosphere. It was like someone pulled the plug on all the transmitters on the air. A sudden and very strong signal came across the radio about 10 seconds later. The software uses a waterfall GUI that represents the frequency in the horizontal axis and time descending in a vertical axis. The band width of the radio at that time was 2.4 Khz. The signal wiped the water fall out, and was descending in nature. Multiple tones and a weird structure, unlike anything I have ever heard. The wife looked at me and asked me what that was, and of course I had no Idea. About 10 more seconds or so go by, and still no signals. I then start to feel the bed and chair rocking back and forth, I asked her if she felt it and she responded that it was normal when the wind blows. It then got progressively worse and I could feel a slight sway in the building. I looked at here and said, “Honey is an Earthquake!” she responded “We don’t get earthquakes in Virginia” after she laughed at me. She picked the dog up off the bed for some reason, he was acting strange, and it hit hard….. The interesting thing is the radio frequency that was generated could be explained by a piezoelectric effect caused by pressures on crystalized rock structures. We do know that specifically Quartz does produce frequencies when pressures are applied. Whether or not they could cause any sort of light phenomenon is beyond me. Looking back I should have had the computer recording at all times and at least tried to get a screen capture. Either way it was interesting, even though I have no proof that it happened. In the absence of evidence, I speculate it was a piezoelectric effect, it did not sound man made. But then again what I saw and heard were not alien abductions, or UFO sightings, nor do I believe it was swamp gas or shared hallucinations. I would love to get more data on it, but speculate I will be long dead before the next one like that hits. I just learned about this paper by the Belgian researcher Wim van Utrecht, skeptical of reports of "earthquake lights." If you are still curious on this topic. Many people in New Zealand claimed to have seen them during the most recent quake. I did not, but a friend of mine who had no prior knowledge of the phenomenon and has a skeptical mind did see them. I'm from Christchurch and was there for the first quakes in 2010 and 2011. I remember seeing an earthquake light through my fogged up bedroom window. It was about 4:30am when I got woken up by the quake, so I was still trying to figure out what was going on. I had never heard of earthquake lights before, so I assumed it may have been from a power station going up (not that I'm even sure that could happen from an earthquake). It wasn't until I looked at the footage from these ones that I even considered that it could have been caused by the tectonic shifting of the plates. If your'e interested in checking the number of quakes that occurred during the dated time in each video then go to this website --> https://www.geonet.org.nz/ if you click on the "view more earthquakes" link you can then filter by severity e.g "moderate", "severe" etc. This is the website that we check anytime there's an earthquake now. Their pretty reliable and they include the magnitude, location, and exact time of the quake. I'm sorry I don't have any of my own footage of the lights that I saw, but if you've got any questions about it let me know. Hi everyone, I'm from Christchurch, New Zealand. I'm not living there now, so I missed the quakes that happened this morning/last night. However, I was there for the first quakes in September 2010 and February 2011 and the thousands of subsequent aftershocks. The September one happened around 4:30am and I remember waking up being really confused as it was the first time I'd felt a really decent shake. At the time I looked out the window and noticed a flashing light similar to the video that Vomkrieg posted, but it had a strong green tinge to it. I remember the window was fogged up a little so I couldn't work out the scale, whether it was within a couple of kms or right out on the horizon. As I had never heard anything about earthquake lights at the time I assumed it must've been a power going up (I'm not even sure that's possible or not). It wasn't until I was watching footage from last night that I realised that what I had been seeing was earthquake lights. Here's another short video taken by someone in Wellington https://www.youtube.com/watch?v=BVVm7g3QgOA last night. Also, if you're interested at getting a thorough idea of the scale and spread of the tectonic activity during last nights quakes then you can look here --> https://www.geonet.org.nz/quakes/felt It's our go-to website whenever we have an earthquake. If you scroll down and click on "View more quakes" you can filter by intensity e.g "moderate", "severe" etc. It's a good site as it includes information on magnitude, location, and exact time. Unfortunately, I never even thought to film the lights that I saw, so I can't offer up any footage, but I am happy to answer questions if anybody has any. Otherwise you could always try and get in contact with the people who posted the videos from last nigtht's quakes. I'm sure they'd have something to say about the lights.